I’m still in love with this little box, but can’t find it anywhere. Maybe it’s time I make a new one. I brought two posts together to tell the whole story with a few edits for ease of reading. Originally published 09/07/2009. This weekend I started the daunting task of digging through the remaining few shelves of stuff at my folks house. I am resolved to go through at least a few boxes every time I visit. This weekend I made it through 3 shelves of “stuff”. You know how you move out of your folks for college, but in your new place (dorm or small apartment) there is never enough room to store all the stuff from your childhood? Then you finally graduate and get a “place of your own” and you will be there in a more permanent way. Time to clear the clutter from my parents’ home. I don’t want to be in my 40′s and still have a box of teenage angst under my teenage bed at my parents. Anyway, this weekend I started in the garage, which used to my studio when I lived there. I have one bookcase of boxes in there. I was delighted to find not teenage angst paintings (yeah, there were some of those in there too), but these great sewing kits made by my Great-grandma Alida. And this great scissor holder made by my grandma – I think this one (with the original scissors) was the one she kept in her side table by the couch where she did most of her reading, smoking, and crocheting. I just love the pin cushions, they are actually little bits of garter stitch folded over, and then tucked into each other to make the pin cushion. I think I want to write up the pattern for this, it’s such a great way to use up little bits of leftover yarn. The scissor holders too. I actually did go on to write it up into a pattern. I’ll post that next I think. It’s pretty stinking cute. Did you see that pretty crocheted piece in that last picture? My grandma was working on it and I found that in her “works in progress” bin when she passed away. I think I’m going to add it to my works in progress basket and finish it up. In tribute to my grandma and my great grandma, I’ve added a third generation to this plastic canvas collection. Something to put in my mending basket. You can make this mini sew box and pin cushion in just a few evenings of crafting. Thank you Cassandra for reminding me of this little gem of a pattern! I’m happy to add things to the website on a per-request basis. And your timing is excellent, I just found a box of peaches n’ creme in my studio clean out. Here the original post with a few edits for ease of reading. Originally published 12/14/2014. Coming up on Christmas – just 10 days of crafting/baking left – I thought it was the perfect time to give you all some ideas for some last minute gifts. This weekend I’ve spent some time on a hand full of things like scarves, hats, and bootwarmers. But for this first last minute gift, I thought I would go with the one I’ve been making in mass for all my friends and fam: Crochet Dishcloths. Crochet dishcloths make the perfect last minute gift. You (and I) can tuck it into a basket of baking or tie with a card for extended family, neighbors, co-workers. One evening of crocheting and you can easily have half a dozen or so. And they are useful! And by next year, they should be worn out enough that no one will mind getting more! Excellent! (In theory anyway, unless you have friends who cherish them like gold plated fine china in which case they are making a shrine to your crafting efforts and that’s okay too). 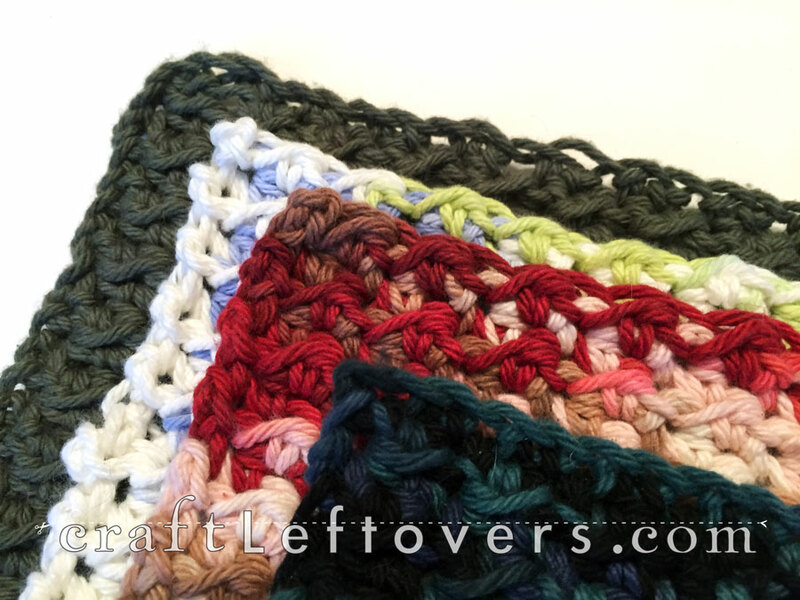 Jump to the bottom of the post for the free crochet dishcloth pattern I love to make. For the most part, I grab my favorite stitch dictionary, select a slightly textured heavy weight pattern, and have a go at it. FYI, if considering stitch dictionaries, I highly recommend Harmony Guides: Basic Crochet Stitches . I have often wondered what size I should crochet my dishcloth. Sure I could go measure the current ones in my kitchen, but when making them from yarn, there are other considerations. Like how wide should it be if I want to get two out of one ball of peaches n’ creme with no leftovers and have it be a square shape? It took a few evenings of crocheting, but I finally had the answer to my query. Right drape, right size, right stitch pattern, right amount of yarn leftover (umm, zero!). I liked the drape and texture of this simple half double crochet and slip stitch “scrunch stitch” pattern. I used a size H hook (tried a G, D, and I). There were four sizes that came out of all this. First I started out with a foundation chain of 27 (#4), then 21 (#1), then 25 (#3), then 23 (#2). Of course the last one I tried, 23, was the magic number that allowed me to make two of the same size out of one ball of peaches ‘n’ creme yarn with no leftovers left. Notes: If you want to make your own of any of the sizes I played around with, here’s the pattern for it all written up. Make a foundation chain of 23 (bolded), if you want to get two out of 1 ball of yarn. Row 1: Sl st in 2nd ch from hook, *hdc in next stitch, sl st in next stitch*, repeat * * to end, turn; if done correctly, you should end with the slip stitch. Row 2: Ch2 (counts as 1st hdc), sl st in next st (should be top of hdc in previous row), hdc in next stitch (top of sl st in previous row, repeat * * to end, turn. Work as row 2 until you have a square. Cut yarn and pull through last loop. Weave in all ends to finish. Have fun crocheting up a storm! Hi! I am an artist, author, and co-owner of a modern apothecary called Little Woods.